The Security & Compliance Center enables your organization to manage data protection and compliance. Assuming you have the necessary permissions, the Security Dashboard enables you to review your Threat Protection Status, as well as view and act on security alerts. Watch the video to get an overview, and then read this article to learn more. Depending on what your organization's Office 365 subscription includes, the Security Dashboard includes several widgets, such as Threat Management Summary, Threat Protection Status, Global Weekly Threat Detections, Malware, and more, as described in the following sections. To view the Security Dashboard, in the Office 365 Security & Compliance Center, go to Threat management > Dashboard. You must be an Office 365 global administrator, a security administrator, or a security reader to view the Security Dashboard. Some widgets require additional permissions to view. To learn more, see Permissions in the Office 365 Security & Compliance Center. The Threat Management Summary widget tells you at a glance how your organization was protected from threats over the past seven (7) days. The information you'll see in the Threat Management Summary depends on what you subscription includes. The following table describes what information is included for Office 365 Enterprise E3 and Office 365 Enterprise E5. To view or access the Threat Management Summary widget, you must have permissions to view Advanced Threat Protection reports. To learn more, see What permissions are needed to view the ATP reports?. The Threat Protection Status widget shows threat protection effectiveness with a trending and detailed view of phish and malware. The details depend on whether your Office 365 subscription includes Exchange Online Protection (EOP) with or without Office 365 Advanced Threat Protection (ATP). See Threat Protection Status report (EOP). Aggregated count of unique email messages with malicious content blocked by the anti-malware engine, zero-hour auto purge, and ATP features (including Safe Links, Safe Attachments, and ATP anti-phishing). See Threat Protection Status report (ATP). To view or access the Threat Protection Status widget, you must have permissions to view Advanced Threat Protection reports. To learn more, see What permissions are needed to view the ATP reports?. The Global Weekly Threat Detections widget shows how many threats were detected in email messages over the past seven (7) days. Malware widgets show details about malware trends and malware family types over the past seven (7) days. Insights not only surface key issues you should review, they also include recommendations and actions to consider. For example, you might see that phishing email messages are being delivered because some users have disabled their junk mail options. 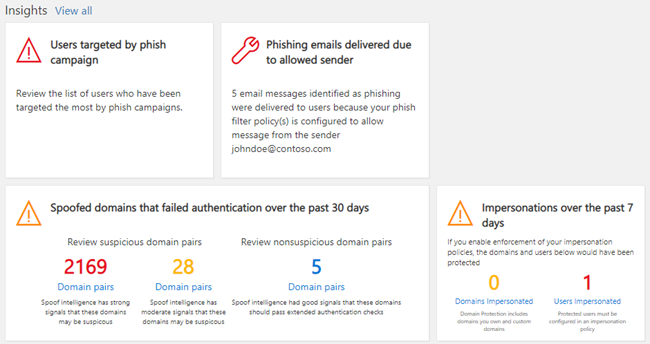 To learn more about how insights work, see Reports and insights in the Office 365 Security & Compliance Center. If your organization's subscription includes Office 365 Advanced Threat Protection Plan 2, your Security Dashboard has a section that includes advanced threat investigation and response tools. Your organization's security team can use the information in this section to understand emerging campaigns, investigate threats and manage incidents. Near the bottom of the Security Dashboard is a Trends section, which summarizes email flow trends for your organization. Reports provide information about email categorized as spam, malware, phishing attempts, and good email. Click a tile to view more detailed information in the report. And, if your organization's Office 365 subscription includes Office 365 Advanced Threat Protection Plan 2, you will also have a Recent threat management alerts report in this section that enables your security team to view and take action on high-priority security alerts. To view or access the Sent and Received Email widget, you must have permissions to view Advanced Threat Protection reports. To learn more, see What permissions are needed to view the ATP reports?. To view or access the Recent Threat Management Alerts widget, you must have permissions to view alerts. To learn more, see RBAC permissions required to view alerts.